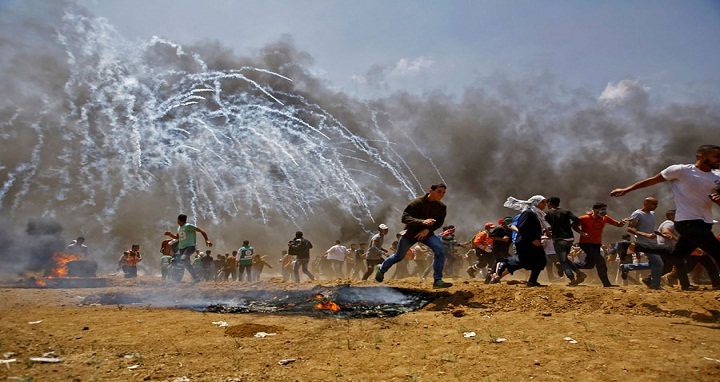 Dhaka, 15 May, Abnews: Palestinians were gathering Tuesday for fresh protests along the Gaza border, a day after Israeli forces killed dozens there as the US embassy opened in Jerusalem on what was the conflict's bloodiest day in years. Palestinians on Tuesday marked the Nakba, or "catastrophe", commemorating the more than 700,000 Palestinians who fled or were expelled in the 1948 war surrounding Israel's creation. Some funerals were held on Monday, while others were taking place Tuesday. "I am happy that my son is a martyr," he said, though he was crying uncontrollably. "He is among dozens who died for the sake of Palestine and Jerusalem." But French President Emmanuel Macron condemned the "violence of the Israeli armed forces against the protesters" while EU foreign policy chief Federica Mogherini said "we expect all to act with utmost restraint to avoid further loss of life". Britain's minister for the Middle East, Alistair Burt, acknowledged "Israel's right to defend its borders" but also said "the large volume of live fire is extremely concerning". Turkish President Recep Tayyip Erdogan accused Israel of "state terror" and "genocide". Turkey also said it was recalling its ambassadors to the United States and Israel "for consultations", while South Africa recalled its ambassador to Israel "until further notice". The UN rights office said it seemed any Palestinian protesting in Gaza, regardless of whether they pose an imminent threat, is "liable" to be killed by Israeli forces. On Monday, the army said "many rioters" tried to breach the border fence and "approximately 10 explosive devices and several firebombs were used to target the security fence and (Israeli) troops". It said shots were also fired at soldiers. Jerusalem's status is perhaps the thorniest issue in the Israeli- Palestinian conflict.